Aren’t those cute fabrics? From the new Cookie Book collection from Cotton and Steel. I haven’t bought fabric in awhile (trying to USE what I have!) but these I needed now. I’m finishing up a project with triangles that I’m really happy with. When I get some sunlight outside I can’t wait to take some pictures. 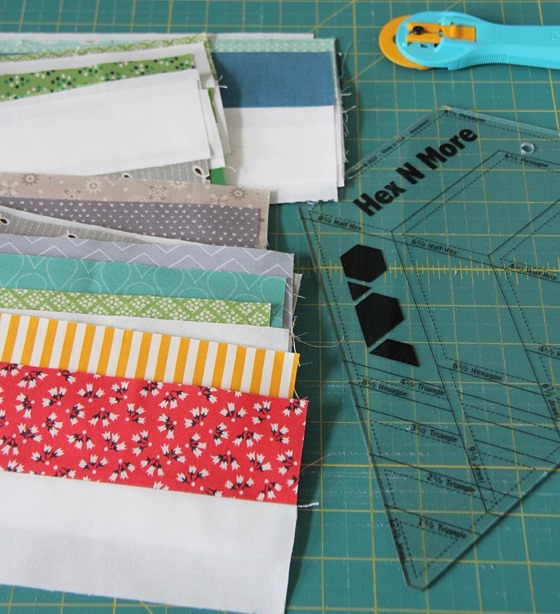 I have a few good rulers that cut triangles, but I love the sturdiness of this Hex n’ More ruler. It’s so big it doesn’t slide around as much while I’m cutting. 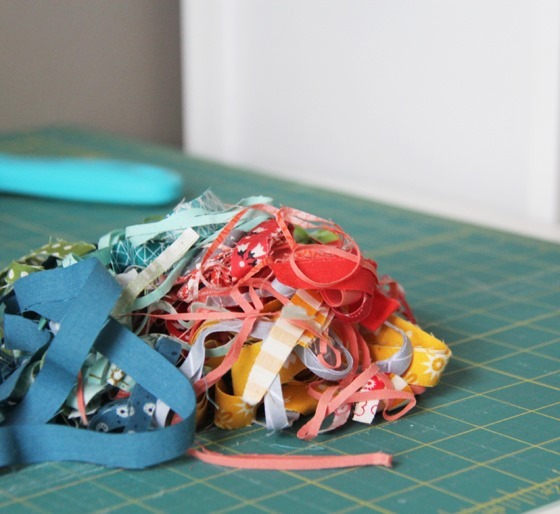 A good sign of a productive sewing week is a trash bin full of pretty scraps. We are gearing up for the Superbowl and the boys have made a list of food requests. They are all about the Seahawks…and I am all about the food. the new Cotton Steel you have is adorable!! I'm with you, Superbowl is always about the food for me too–namely velveeta queso dip and ruffles with ranch. Those are our two must haves!! such cute fabrics. although i bought some fabric recently I am trying to quilt with only stash fabrics. I LOVE the feeling of seeing a pile of quilty scraps and trimmings, too. The fabric is lovely! 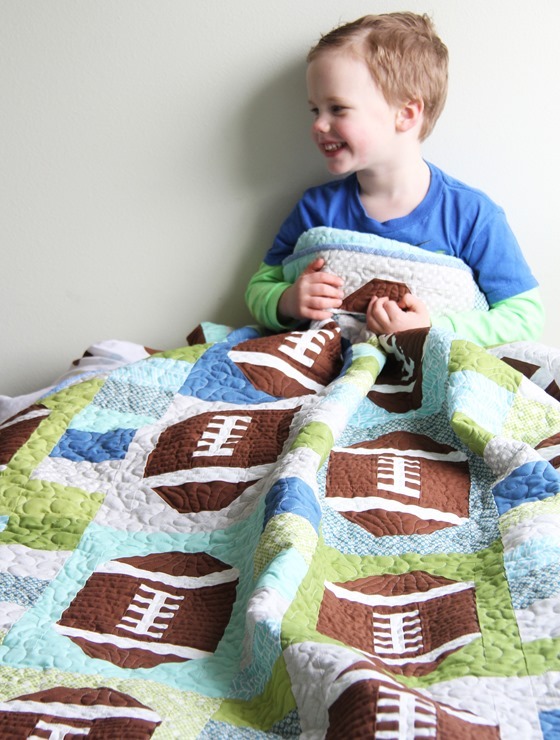 The football quilt is adorable and what a cute model! I am usually all about sewing on Super Bowl Sunday. But food is good too. That pile of trimmed fabric says progress to me. Can you say REPEAT!! Go SEAHAWKS! And I love that quilt. Love the fabric and the football quilt. Where can I find the pattern for that? By the way I'm from Mainw! May the best team win! Enough of this deflated ball drama! 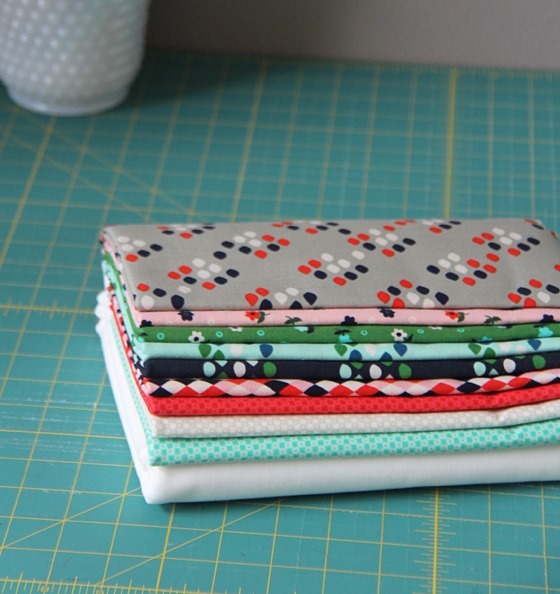 Great fabric selection and look forward to see what you make. I have that darn ruler and can't find the time to try it out! And the Seahawks quilts is wonderful! I'm not into the "Stupor Bore" at all, but I was born in New England…so ( whispers and ducks) GO PATS! What a great quilt.Up here in North Vancouver it's Go Hawks Go.So we have a date with the box @ 3pm Sunday….got the stitching planned. Love your football pattern quilt. I made it with Kona solids for my cousin's son. He absolutely loves it. Made your button up one for his sister. Wonderful patterns!! How can I get the pattern for the football quilt? I love all things Cotton + Steel. Some day I will actually buy some and make something. It is nice to see a pile of scraps even if it is on someone else's table. You always put the best fabrics together! I joined the I want her stash club and can't wait to see what you come up with! I hope you haven't been busy online for a while because you are pregnant and barfy. Not that I want you sick, but being barfy means your body is rich with progesterones and most women rich with those rarely miscarry. But maybe you are busy developing a wonderful new line of fabrics. I just hope you are really happy with whatever is happening!